Growing up, Carolina Basketball was one of the only reasons I was allowed to miss church. We went anytime the church doors were open, but if there was a game Mom would make an exception and we would stay home to cheer on the Tar Heels. As a preschooler, I have vivid memories of taunting our Preacher, who had the misfortune of getting his divinity degree from Wake Forest, on the way to preaching on Sunday mornings or church supper on Wednesday nights. I would stop in my tracks, I am sure goaded on by my mother, and call- “Go Tar Heels” and he answered “Go Demon Deacons” while the parishioners looked on with indulgent amusement. I was a Tar Heel. The Tar Heels were my team. My mom loves Carolina basketball. Through her, my sisters and I came to love the game as well. As we watched Dean Smith lead the Heels on the court, we got lessons like, “look how the scorer acknowledges the passer” and “see how Coach Smith would rather get a technical than not start a senior on senior night.” From the basketball court and through the T.V., Coach Smith coached me as well. While never a player, I learned to be a smart, engaged fan, to appreciate a well-played game, and to see how the lessons learned through basketball could be applied to my life, too. My good friend Derrick, a State fan, jokes that people in the South love Jesus, the Pope, and Dean Smith- though not necessarily in that order! Like many others who are honoring Dean Smith, I can ply you with facts and statistics; my head is stuffed with them. He learned the game at Kansas from Phog Allan who learned from Dr. Naismith himself, joined Frank McGuire as an assistant at UNC in 1958, took the helm as head coach in 1961 amid point-shaving rumors with the missive only to run a clean program, was hung in effigy after a 1965 loss to Wake Forest, used the four corners strategy so well that in 1985 the NCAA created the shot clock, retired in 1997 with 2 national titles, 11 Final Four appearances, 879 wins and a 77.6% winning record. All of these accomplishments are important, they add up to what his work was, as a coach, but they do not begin to cover his importance to UNC, North Carolina, and basketball. As a basketball fan, it wasn’t just supporting a winning team that made me a Tar Heel. It was the lessons that I learned from Coach Smith, through basketball, that were the most important. Coach Smith is credited with inventing the tired signal a player can give to let the team know he needs a break. Basketball is a team sport. It is played best when players communicate with the coaching staff and each other. Communication is key to winning games. He also taught his scorers to point back to the passer that set up the play for them. The scorer gets credit for the basket, but they did not do it themselves. Good players spread the credit around. Coach Smith liked fast breaks, half court offense, and aggressive defense. He trained his teams to listen to the point guard who called the plays on the court. He was the coach, but there were times that you looked to those around you for leadership. When you know who to look to for instructions, you can do your job the way it needs to be done. On Senior Night, seniors, whether they are regular starters or not, start the game. If there are six seniors, Coach Smith accepted the technical foul to start them all. All team members are valuable and it is the coach’s job to recognize that. Though not the inventor of four corners, Dean Smith taught his teams to execute the strategy so well that the NCAA had to invent the shot clock to counter it. I agree that basketball is more fun to watch with a shot clock, but if you are going to do something do it so well that they have to create rules to evolve the game. 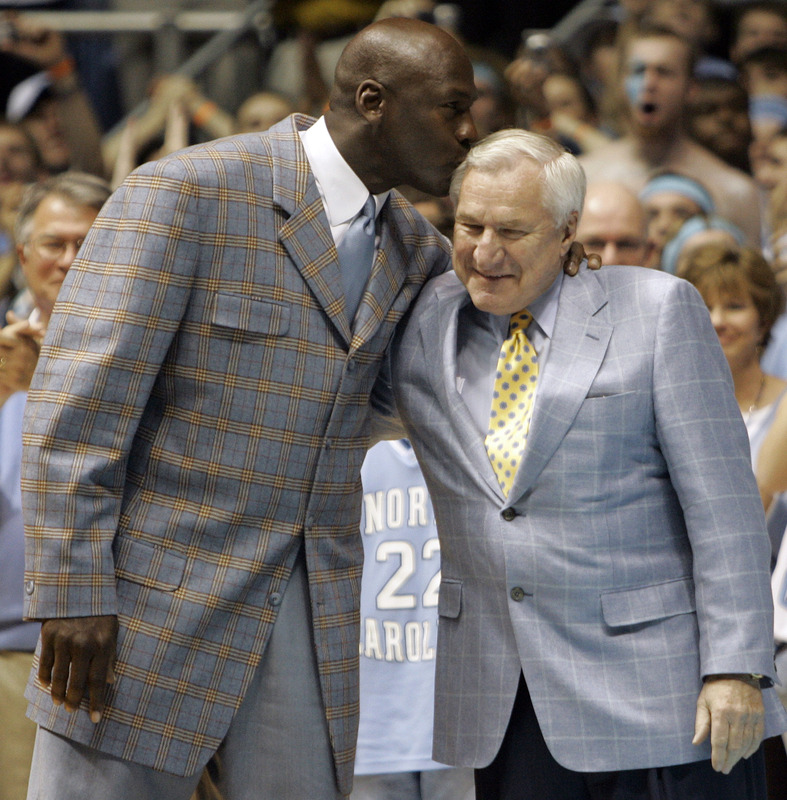 As I got older, I realized that Dean Smith was special off the court as well. His memory is legendary. Those who knew him said he could recall details of games played years ago and would remember to ask about your family members by name. He was also quietly and solidly a progressive moral compass that I could set my own sails by. He was an unapologetic political activist, cultivated by his father who coached the first racially integrated basketball team in Kansas in 1934, but always quiet and never shouting it. When he arrived in Chapel Hill he joined Binkley Baptist Church because it included everyone. As an assistant coach, he, along with an African American theology student, went to The Pines, a restaurant on Franklin Street, and stood together to be seated. This was real work in the still segregated south of the late 1950s and by the time the sit in movement came to Chapel Hill places like The Pines were already integrated. In 1966, he recruited Charlie Scott to play for UNC and with that action integrated the ACC. He was a vocal opponent of the Vietnam War in the 1960s and recorded anti- nuclear weapons radio spots in the 1980s. In 1998, he appeared at the clemency hearing of a death row inmate and told then Gov. Hunt, “The death penalty makes all of us murders.” In retirement, he took stands against the Iraq war and for gay rights. Dean Smith, along with fellow North Carolinian Andy Griffith, were my models for how to think about issues that we face in our daily lives and how to navigate living with integrity and doing what is right with the power that you have. I’m always happy to rehash Tar Heel basketball details, like how free throws and time outs were factors in both the 1982 and 1993 National Titles, but what I will remember about Dean Smith has much more to do with the lessons he coached me through as a spectator and Tar Heel Fan. While I haven’t had time to post, this has been a great week of college ball. Louisville came to the Dean Dome and the Heart Attack Heels topped the Cards by one point (72-71) with Marcus Paige’s shot in the last seconds. On top of that, for the last two Duke games, I had the privilege of seeing red while visiting diddukewin.com. Their first loss was at the hands of the unranked Wolfpack at the PNC Arena. It was at PNC, in March, when the Mercer Bears handed Duke their last loss. I was jumping and yelling as NC State pulled off that victory! Last night, the Miami Hurricanes blew into Cameron and upset the Devils at home. This is Duke’s first loss at home since 2012 and Miami’s third win over ranked opponents this season! Tonight, is the Battle for the Wes Miller Bobblehead- every time UNC meets NCSU the outcome of the game decides if our bobblehead will reside at the Colonna or the Newkirk house. Wes has come home with me for the last two Tar Heel victories and D feels with the Duke win the Pack is poised for greatness tonight. The Red-Blue game is at the same time that UNCG meets VMI at home, so it is double basketball for us tonight! Today, with losses by both Michigan State and Arizona, my bracket is completely busted. I had those two in the final with the Spartans taking it all. I don’t love any of the final four teams. Kentucky wears that garish shade of blue, plays dirty ball, and relies to hard on the one and done players- blah, no thank you. Billy Donovan and his Gators lost it for me with his piss poor coaching against UConn in their loss to the Huskies. UConn has been a perennial “no thank you” but with their new coach, the time they have spent in “no post-season” purgatory, and the on-court leadership from Shabazz Napier this season they may be the best of a lack luster choice. (I also saw Napier’s mom saying “good job” to the MSU players as they walked into the locker room today- good sportsmanship is learned early and that was nice to see). I own two dachshunds and it is just hard to root for the Badgers. On a better note, the Lady Heels won against that other “Carolina” and will be meeting Stanford in the elite eight. If they get another win, Coach Haskell will be meeting the ladies in Nashville. Go Carolina! I have some work I need to do for school, but it is hard to get anything done when today is the day the Big Dance brackets are set and my favorite app opens for the post season! There’s about 45 minutes until the ACC championship tip-off, Go Cavs, beat dook!- but there are so many good basketball stories swirling in the air right now. Who’s gonna get that fourth #1 seed (maybe Virginia if they knock off the devils)? Is Wichita State gonna go perfect for the season (unlikely unless you are the Lady Huskies)? Is this the year that a #16 beast a #1? It’s never happened, but one of these years…. As we wait for the ACC to start so that they can finish, there were some good stories from conference championships around the country. Perhaps as not a surprise, but worth commenting on nonetheless Louisville beat UConn in fairly spectacular fashion. I have no love lost for Rick Pitino (and the particular shade of blue that the Cardinals play in hurts my eyes), but their run through the AAC tournament (does AAC tournament sound made up to anyone else?) has been thorough. They beat Rutgers by 61 points and the 10 points they beat the Huskies by belies a much harder game that was played. This was the fifth meeting in a row where the Cardinals beat the Huskies in double digits. I was rather surprised that UCLA routed #4 Arizona, though I guess I shouldn’t have been. They are both strong teams and the rivalry growing between them leads to passionate play on both sides. Arizona’s defense was just ineffective against the Bruin’s quick offense. I am going to ignore the Wear twins in all future discussions of UCLA, for obvious reasons, but they were effective from mid-court for this game. UCLA won this game by 4 points, play was fast and fun, but the Wildcats did miss 6 free throws in the game. Those points left on the court could make all the difference between going to the Big Dance and going to the Big Dance as a #1 seed. The shocker of the day was Providence’s 65-58 win over Creighton. I thought Creighton had that one, no problem. The Blue Jays have been hot and Buckets McDermott (click on this link you will not be disappointed) is an offensive machine. This game was a study in how a steady game wins the race. A good mantra to mediate on as we enter the live or die moments of the post season- you have to show up to the game and play a full 40 minutes (I’m looking at you Carolina) to win the title. Luke Nadkarni wrote a piece addressing Wolfpack fans and telling them to grow up. He wrote, “And for State fans to be throwing debris on the court at the end of the game is simply unacceptable. For as much as we brag about being great fans, we sure don’t act like it…Good fans don’t act like kindergartners when their team loses.” Owning that is not what State fans wanted to hear, but as someone who love great basketball perhaps what needed to be said. One the other hand, that does not take Tar Heel fans off of the hook. I agree that the behavior and the feelings of being less than need to stop. It must be hard to struggle to make the top 25 when you have such a great history of basketball. But discounting NC State, beyond the usual back and forth that comes from sport and competition because I do love some trash talking, is a disservice done on our part. Fans have called out the victory as less than citing an empty Franklin Street after the win (compared to the flooded street last week in the win over Duke). Even ESPN was brought into the social media fray as people linked to the their listing of the UNC-NCSU rivalry as the #2 overall most one sided rivalry in the 21st century. That is true, the 21 century has not been kind to NC State basketball, but great basketball traditions are built over decades, not years. Tar Heel fans would do good to remember that! I think Tar Heels need to remember history and not dismiss NCSU so easily (maybe dismiss their immature fans like the one who threw a dip can a Paige). The hate for Duke represents all that is good in this world, but we were a rival to State before Duke came into the picture (The oldest rivalry (in basketball) in the state is actually Duke-Wake as they used to be located so close to one another. Also, before intercollegiate athletics, sports were played among on-campus classes- freshmen vs sophomores, etc). One thing that being “Tar Heel born and Tar Heel Bred” is that we know good basketball, we hate hard, and we love harder. One of the biggest faults (and there are many) of the Crazies is that they are so often from out of state, don’t know their basketball, and jump on the dook bandwagon when they come to school down here. They may (misguidedly) love dook, but don’t know anything else about southern basketball. Tar Heels should know their history. To be a Tar Heel is to respect the fact that we have been playing State since the 1910s (they won twice to our none in that decade). The Pack is going through a tough time now, but history shows they are in it for the long haul. UNC and NCSU were charter members of the SoCon (1923) and until the 1950s State took that conference 7 to our 3 championships. dook did not join SoCon until 1929. Yes, We have taken State in ACC championships 17-10 since 1953. When the ACC became large enough for divisions- State became our cross division permanent partner. In the Dixie Classic Tourney (1949-1961), State took 7 championships to our 3. In the Big Four Tourney (1971-81) they took 3 to our 2 championships. No, right now there is no parity between the light blue and the red. Yes, they are acting like children. Maybe their fans don’t know their history, but Tar Heels should. You should hate hard, but love even harder. We are good right now. It feels good to tell State to stop acting like the bratty little brother, but that brother has been around longer than anyone else. Carolina basketball is fun because we are good, but it also comes from a good history of strong basketball. To ignore that, to make light of that just because of current basketball conditions is disingenuous to the idea of basketball from North Carolina. Tonight, as UNCG lost to rival Elon (oh my- there were some whiney Phoenix sitting behind us) PJ pulled up the Syracuse- Boston College game on his phone (gotta love technology). The game was tied at 50 and they went into OT as we walked out to the car. Once in the car, we put the game on through the Bluetooth. They were tied at 52, then BC pulled ahead. The Eagles made their final four foul shots in a row and won the game 62-59. BC, who only sits above VT at the bottom of the ACC rankings, stuns #1 Syracuse! The Orange was projected to win by 14 and they lost by three. Syracuse was surprised and BC’s celebration was written all over their surprised faces. As the seconds ticked down in OT, PJ and I discussed the last time that BC had upset the #1 team in the nation. They beat UNC January 2009. Yes, the team that was projected to have an undefeated that season. The team that went on to win the National Championship. As a Tar Heel fan, that was hard to watch, but what rubbed the salt in the wound is that three days later BC lost to Harvard. Yep, they beat the #1 team in the nation, the team that went on to win the NCAA Championship and dropped a game to Harvard. If I remember correctly, the question that kept being asked was: Does Harvard even have a basketball team? Fast forward 5 years later, Harvard basketball has grown and they have gotten some strong recruits, but in 2009, it was shocking to the Tar Heel soul. We lose to BC then they turn around and lose to Harvard. What was right in the world? Good job tonight, BC? I was hoping that the Wolfpack would have knocked them off of perfect last week, but I’ll take it this week instead. One of the perks of being a graduate student is that I can go to a 2pm home game on campus. Watching the UNCG women beat South Carolina State is a nice way to spend a fall afternoon, especially when my friend Lee Burgess joins me for the second half of the game! The Lady Spartans jumped out to a quick 8-0 lead and led for the entire game against the Bulldogs of SC State, winning 72-63. The Spartans were giving (and receiving) hard body checks for a game filled with physical play. The on-court leaders, including Janea Stevenson and Lucy Mason, drove the plays and kept the energy high. They were helped by 20 points from the bench (compared to SCSU’s 2). When looking at the numbers: SCSU had a disheartening 9% three point game, shot only 39% from the field, and contributed on 54.5% from the line. It is hard to win games with those numbers, Bulldogs! The Spartans, while better, have some room for improvement. The offered 40% from behind the arc, 43% from the field, and 64% from the line. That free throw number, at the collegiate level, needs to be up- higher than 7/10. Then, I was subjected to the heart stopper that was the UNC– Holy Cross game at 8pm. I have been a Tar Heel fan long enough to know that watching them play basketball is sometimes an exercise in patience. It is often easier to watch games at home where you can pace, when needed. They like to dawdle in the first half and come back in the second, but there were moments during this game that my doubts about them winning were high. These Heels are a team without a leader and they have no focus on the court. Oh, if only Kendall Marshall had stayed- nonetheless, Marcus Paige is a great guard (but I want him at the point instead of Nate Britt- let’s be honest, I want it to be 2009 and have Ty Lawson back! ), he tied his career high 23 last night. This team needs a leader. If PJ Hairston was on the floor he may be the one to assume that role (the NCAA has yet to weigh in on his return) and many are hoping that James Michael McAdoo will strengthen his leadership. McAdoo is a great ball player, but I am not sure that they weight of leadership rests easily on his shoulders. This is a good team (much better if Hairston and McDonald were on the court), but they need to get it together, find focus, and play ball like a team. Roy Williams does not get a pass on that game last night, either. I know that he wants players to play through frustrations and calls few time outs. But last night at about the 16 minute mark of the second half, the Heels had not scored and players were showing their frustrations, fraying on the edges. It would have been the perfect time for a “let’s get our heads on straight” time out. That is what they are there for, coach! I want to give Holy Cross their due. The played a hard game last night. The stats for both teams showed close numbers in the field goal, three point and free throw percentages. I am a believer in close games to galvanize a strong team to find their potential, but a bit of me wants the Heels to flounder on December 7th….shhhh, don’t tell my mom!